The flamingo family consists of six different species of wading birds that are known for their colorful orange/pink plumage. 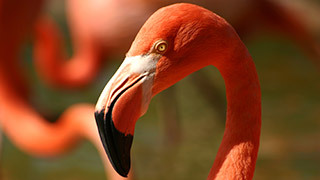 Flamingoes live along the coast of Africa, South-West Asia and the America's. They stamp with their feet in shallow water to stir up food on the bottom and are known to stand on only one leg while resting with the other leg folded up under their body.